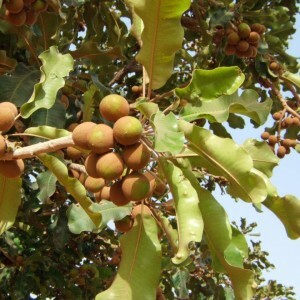 EUGENE, Ore. — University of Oregon anthropologists have pushed back the history of harvesting shea trees in West Africa by more than 1,000 years earlier than previously believed. Evidence for earlier use of the wild trees dating to A.D. 100 — reported in the March issue of the Journal of Ethnobiology — surfaced from excavations at the well-preserved archaeological site at Kirikongo in western Burkina Faso. Shea trees only grow in a narrow belt of fertile, well-drained soils in the savannah stretching from West Africa to East Africa. Nuts from shea trees (Vitellaria paradoxa) are the source of thick ivory-colored vegetable butter — a staple used as cooking oil in the region. Shea butter, which is rich in antioxidants, also is used medicinally and exported for making soap, moisturizers and lotions. It occasionally is a substitute for cocoa butter. The tree’s termite-resistant wood also is used for construction and making implements. The researchers analyzed thousands of carbonized fragments of nutshells found in multiple layers of households that had been built on top of each other for some 1,600 years.